My very good friend Ted has a bumper sticker on his truck that says: “God is not a Republican . . . or a Democrat.” Ron Sider would agree. The unusual thing about Sider, though, when compared to most Christian spokespersons, is that he cares passionately about the poor. Most white Christians in America view the poor as merely the competitively challenged among us. Sider says that Christians must “hold together two truths: persons are made for both personal freedom and responsibility, and for communal interdependence” (p. 69). In the conservative Christian circles I’ve moved in all my life, there’s a lot more talk about the former than the latter. But Sider reminds us that “poverty results both from wrong personal choices and unfair systems” (p. 65). And many of America’s expensive programs for the poor actually work. He argues (convincingly, I should add) that God has a special place in his heart for the oppressed and disadvantaged, and therefore we ought to too. 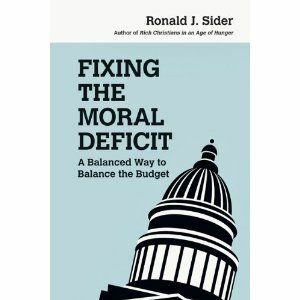 But Sider is strongly opposed to America continuing to run up its deficits. He calls this spending of our children’s and grand-children’s inheritance “inter-generational injustice.” And he views our staggering accumulation of debt as a kind of willful national suicide. But he sees a way out. He does not regard economic wisdom and moral justice as incompatible. His proposals for reform are surprisingly detailed and astute—he knows what he’s talking about. Years ago in Scotland I used to take the train down from St. Andrews to Edinburgh through the dirty little industrial town of Kirkcaldy (pronounced kirk-cawdy). It’s where the Scots invented asphalt and linoleum, and it’s the home of Adam Smith, the author of The Wealth of Nations and in many ways the father of capitalism. Capitalism is not intrinsically Christian. It more like Darwinism, frankly. Ask the young people contemplating suicide in the sweat-shop conditions over in China where our beloved Apple products are assembled. Without humane and Christian restraint, capitalism exploits. Greed is not Christian either. For centuries Christians have recognized it as one of the seven deadliest sins—like the grave, it is never satisfied. Personally I still cannot grasp the argument, touted by otherwise intelligent people, that the rich cannot be taxed their fair share lest they move away, or decide not to be entrepreneurial any more. Are you kidding me? For one thing, these people are amongst our fiercest competitors—will they give up because of something as innocuous as a tax? Why shouldn’t that incentivize them to do even more? But more importantly, no rich person in America could acquire or retain anything they own if it weren’t for the countless number of ordinary Americans who are supporting and facilitating their success. If all else fails, can we not shame the rich and successful into being a bit more obviously grateful and patriotic? America’s deficit problem is a moral problem. It involves the greed of many callously rich and under-taxed Americans. Yes, it also involves the indolence of many who access the safety net of this country when they could and should get out and earn their own way. It involves the envious who feel entitled to take what others have acquired through skill and effort. It also involves the sleazy insiders who cheat the system and take care of their own above the common good. It includes those who make money on wars when the blood of Americans and their enemies are needlessly squandered. It involves all of us who are unwilling to make sacrifices now for the sake of the next generation. Very few of us look squeaky-clean here. Neither President Obama or the Republican contender can save America. Our problem is deeper and more pervasive, and most disturbing is that I’m part of it. To paraphrase C. S. Lewis, “we are Legion.” We do not have a financial deficit. We have a moral one. Some days I’m tempted to give up on the church, but then I remember that Christ hasn’t, and maybe, just maybe, the church can point America to a better way. Ron Sider is one believer who is trying to do just that.